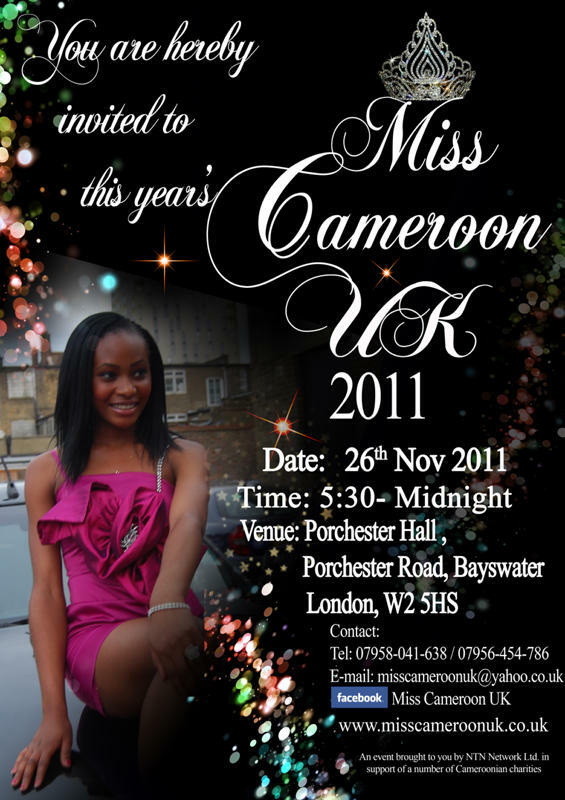 Miss Cameroon UK is a prestigious event aimed at celebrating the beauty and talent of every Cameroonian woman. It is an innovative way of putting the territory on the world map and letting all her friends learn about the historical, cultural, traditional and all other aspects of the Cameroonian life especially its tourism and investment potentials. The Miss Cameroon UK 2011 beauty pageant showcasing ten very beautiful African queens from Cameroon as contestants will take place on Saturday the 26th of November 2011 at the prestigious Porchester Hall in London (www.porchesterhall.co.uk). The event organized by NTN Network Ltd, works in close collaboration with a number of Cameroonian community charitable groups like the Cameroon Community Welfare Development Association, CACOWEDA UK, Femmes Dynamique UK, will delightfully have Femmes Modernes UK as a partner in this year’s Miss Cameroon UK. Femmes Modernes UK is a voluntary group set up in 2003 with mission to raise the profile of all Cameroonian and African women by assisting them and ensuring that they play an active role in the development of their local communities. Also, the group is out to ensure that women are protected from all forms of discrimination, violence or abuse. On behalf of their participation in this year’s Miss Cameroon UK, Femmes Modernes UK President Angeline Yakam says they are extremely pleased with the opportunity and intend to raise funds to enable them continue their support for young mothers in Cameroon as well as organise a special women’s day come the International Women’s Day 2012 showing their appreciation to all UK based outstanding women in the local community. On a very delightful note, the organising team of the Miss Cameroon UK announces that BB-Photos will be the official sponsor for the Miss Photogenic prize for the Miss Cameroon UK 2011. BB Photos is committed to using the artistic sights of photography, making use of historic sites for the decoration of homes, offices, business premises and for adverts. Founded by Benjamin Bin Meh, a talented Cameroonian born and award winning photographer of the Arriva Deutsche Bahn Europe Photo competition in July 2011, who is also a member of the UK Royal Photographic Society, is currently exhibiting a Transport for London Project and many more exhibitions scheduled till the end of the year 2011.